Nicole “Nikki” Christine Bohne (pronounced Bonnie) is an American singer, actress, and dancer. She was born in California in 1987 and raised in Utah. She is a member of The Church of Jesus Christ of Latter-day Saints. Bohne is a former member of the Brigham Young University Young Ambassadors and toured throughout the United States, Australia, and the Nordic countries. She took a short break in her studies to perform as a singer for Tokyo Disneyland. She also made a small appearance in High School Musical 3. 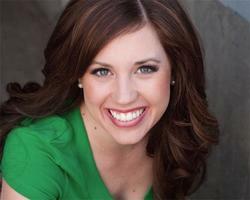 She graduated from BYU in 2010 with a BFA in Music, Dance, and Theater. After graduation she moved to New York City and within weeks she was cast as Elle Woods in the Broadway national tour of Legally Blonde: The Musical, 2010–2011. She was cast in the national tour of Bring It On: The Musical. The show transferred to Broadway ten months later (August 2012) and Bohne covered for the four leading women roles. She then served as the official replacement for the role of Eva toward the end of the show’s run. She was seen as Sandy in Grease at the Gateway Theater and Urleen in Footloose at Kansas City Starlight. In January 2014, Bohne joined the first national tour of Wicked in the ensemble and as an understudy for the role of Glinda. This page was last edited on 1 February 2014, at 14:36.